My mother-in-law will kick me in the shins for saying this, but I’m actually a little disappointed at the amount of snow we’ve had so far. NONE. There was one morning about a month or two back where I woke up to a light dusting of snow on the ground but it was gone within a few hours. Boo! Despite the lack of winter wonderlands, it’s still been fairly brisk this year. There are few things as distinctly miserable as having to leave the comfort of a warm bed on a dark and chilly morning. It’s bad enough when it’s cold, but dark too? My brain just tells me it’s time to get up and be productive! while my body is just laying there saying nope.nope.nope. until I finally force myself up. 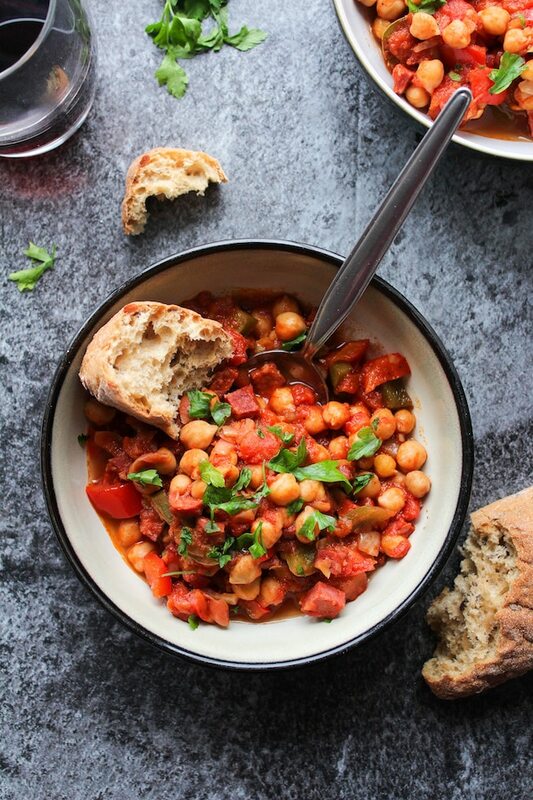 At least I can console myself by warming up with hot bowls of comfort food like this chickpea & chorizo stew. It’s like a hug in a bowl, but with added garlic and chorizo. I’ll take it! 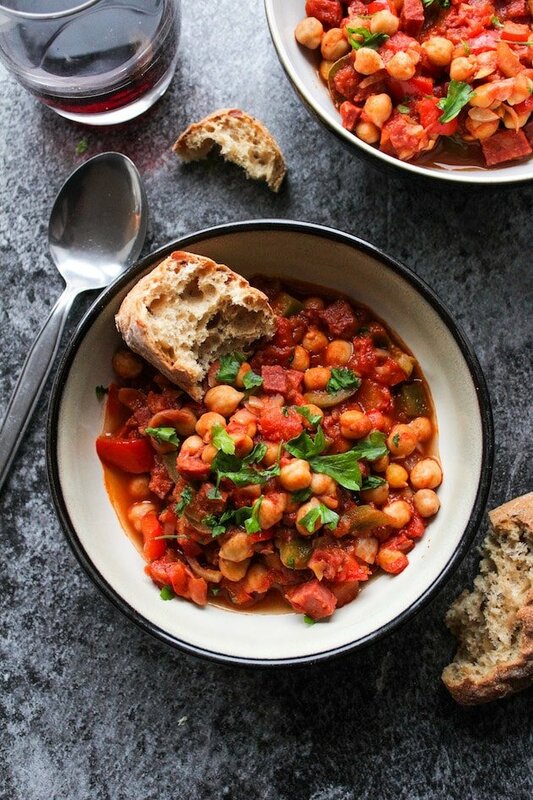 Would you believe me if I told you that this chorizo stew takes 30 minutes to cook – tops? Even including prep time? Maybe if you’re a slow vegetable chopper like Mike you’ll cut it close, but I’m sure even he could finish this in time. The base of this recipe starts with a quick sauté of garlic and onions. Let those two sweat it out for a couple of minutes while their aromas release and they begin to soften. Next, you’ll add the chorizo, pepper, and bay leaves to cook for another 5 minutes while those flavors release. Then you simply introduce the wine, tomatoes, and paprika, cover and let that mixture stew gently on the stove for about 5-7 minutes. Finally, add the drained chickpeas, let those warm through and then season and serve. Don’t forget to throw a handful of chopped fresh parsley for a little added brightness and you’re all set! If you’re really feeling ambitious you can even make a fresh loaf of bread to go along with this. How’s that for fast and easy one pot wonders? 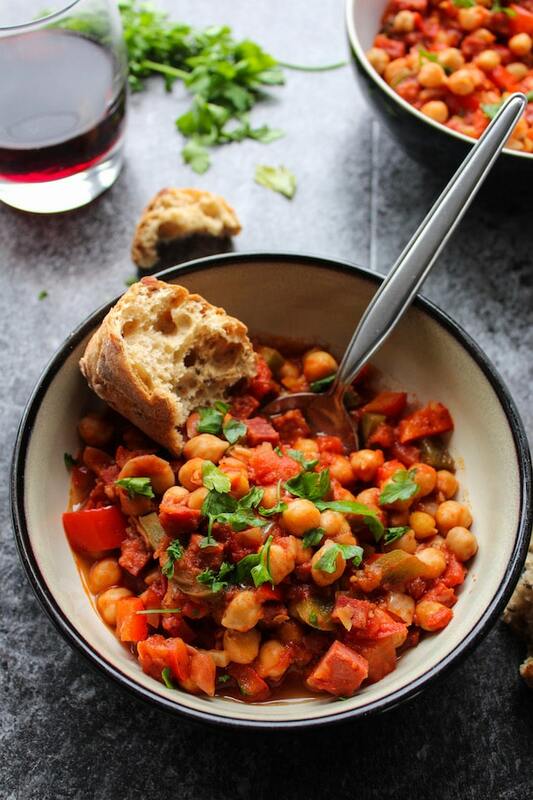 Don’t forget to #asaucykitchen on instagram if you make his chickpea chorizo stew! I love seeing what you make! You can also post your pictures to our facebook page! Warm the olive oil in a large saucepan over a low heat. Once the oil is warm add the onion and garlic and sauté for 3-5 minutes until starting to soften. Stir frequently to keep the garlic from burning. Add the diced chorizo, peppers, and bay leaves and cook for another 5 minutes. Add the red wine, paprika, and chopped tomatoes. Give it all a stir to micx together and increase the heat to medium. Cover and let that gently stew for about 5-7 minutes. Remove the lid and let cook uncovered for 1-2 minutes to let the sauce reduce slightly. Add the drained chickpeas, cover the pan once more and cook for another 3-4 minutes on a low heat to warm the chickpeas through. Season with salt & pepper, and taste. Sprinkle over the fresh parsley and serve. Oh yay! So glad you liked it! Thanks for coming back to let me know what you thought! Thanks Yas! So glad you enjoyed it! 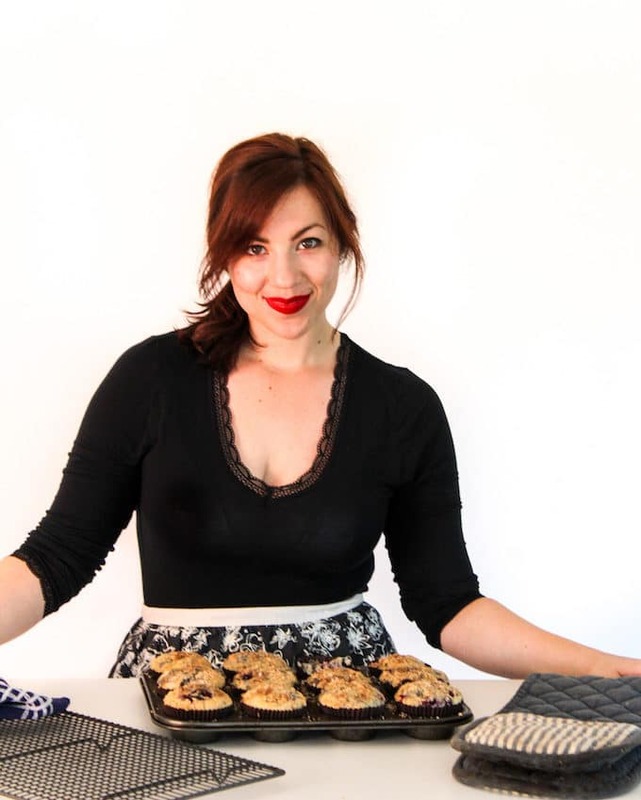 I just made this and I’m eating as I type; it’s delicious! Thanks for the great recipe. That’s awesome! So glad you like it 🙂 Thanks so much for coming back to leave a comment and review letting me know how it went! I don’t see chickpeas on the ingredient list. How many cans are needed? Well that’s embarrassing! 2 400 gram cans of chickpeas drained – it should be fixed in the recipe now. Thanks for pointing that out to me!